(Newser) – The ship was fashioned after the Titanic, and met an end no less tragic, but the tale of the Cap Arcona—and the thousands of concentration-camp prisoners who lost their lives aboard it—is one you've likely never heard. The "Nazi Titanic" gets its due in a new book of the same name by Robert P. Watson, a historian and professor at Florida's Lynn University. The German luxury liner was built in 1927 and traversed the Atlantic 91 times, reports the Columbus Dispatch in a review of the book. During WWII, it played the role of the Titanic in a Nazi propaganda film made to depict the English in a bad light (that ended up being a bust), but it otherwise sat at port in the Baltic Sea until the war's final month, when Adolf Hitler had the ship packed mostly with concentration-camp prisoners. 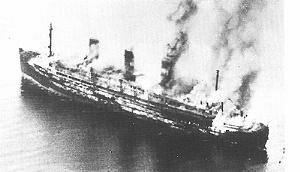 Records unearthed by Watson indicated Hitler intended to have a U-boat destroy the ship. The Nazi role, under Hitler, was to kill as many Jews and Protestants as possible. Same with Stalin. The key to the success for both was that the above goal was hidden under the perceived cover of 'science.' End result was perception confusion. Vatican was the source of both ideologies of fascism and Marxism. Rome thinks in retribution in generations later. A perversion of Christ's warning. Later on Stalin rebelled against Rome, so possible he was poisoned. Castro is in the same genre. Babylon Romish 'Christianity' pagan religion rules. Look at the construction of DC. So much going on in plain sight yet hidden. I have never heard of a Nazi. This is a mystery to everyone.